I've found the course so inspirational and enjoyable! It's just perfect for me. You will learn so much from the course it's hard not to enjoy it. 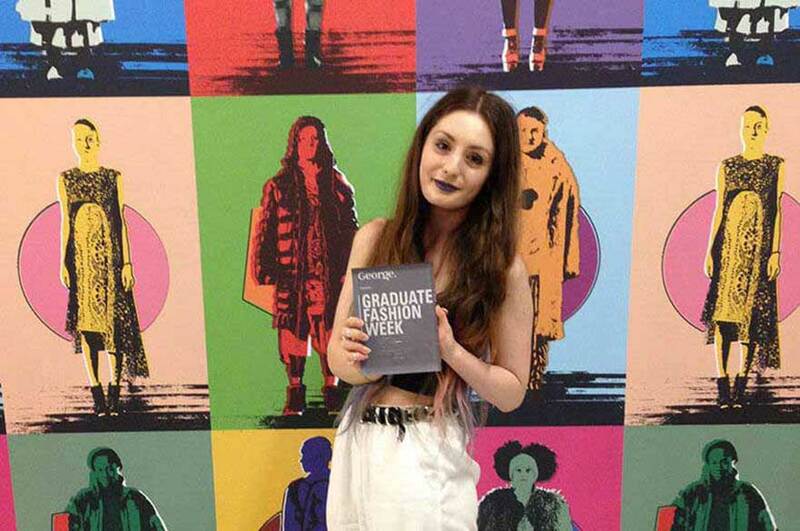 Stephanie was awarded the Accessories Award at Graduate Fashion Week 2014. "Even from when I first started looking around universities and going to open days, as soon as I'd visited NTU I knew that was where I wanted to be. The University itself is a really nice environment and Nottingham is a really nice city. The University's facilities are of a really high standard and they have everything you could want to implement your ideas into products." "I love my course! It's so much fun as there's so many opportunities to be creative. I've learnt so much in my first year and without all the workshops and facilities I wouldn't have been able to achieve what I have. "On top of that, the tuition we receive on the course is amazing. All the lecturers are really helpful and friendly. As we are a small year group we practically have one-to-one tuition whenever we need it throughout the week." Can you tell us about one of the guest lecturers you've really enjoyed? "In our first module we had Katie Harding from Pittards come to work with us on a weekly basis. This was really helpful as we got one-to-one tuition with her where were able to share our ideas for our products and she would help us in the functional aspect of our designs to ensure the final product was finished to a high standard. "In our second module we had Kat Marks come in to do a talk for us about her career and projects that she's worked on and to teach us about the materials that she works with; it was really inspirational. Kat then stayed with us for the rest of the day and went through our projects with us and shared ideas. Through this I learnt about a new material which became the main aspect of my second project." "They are really friendly and helpful. Our tutor and lecturer is a really helpful and friendly teacher, he's always there to offer a helping hand whenever you need him. Also some of the technicians I've worked with have been extremely helpful, especially Richard Arm from moulding and casting workshop. He's really helpful and genuinely interested in the course and what we do and was really keen to help out with ideas." What do you like about studying in Nottingham? "Nottingham's a really nice student city. There's stuff to do for everyone and a day doesn't go by where you haven't got stuff to do. Whether it be spending time doing university work or going out for a day shopping with your housemates, you'll never be bored! "Also, if it's your cup of tea, the night life is really good for students too with different student nights happening every night of the week. There's so many different places to discover, whether you like bars of clubs, there's something for everyone no matter what your taste in music." "I've found the course so inspirational and enjoyable! It's just perfect for me. You will learn so much from the course it's hard not to enjoy it. The tutors are all really skilled in the areas that they work in, so you have the required support to do well."